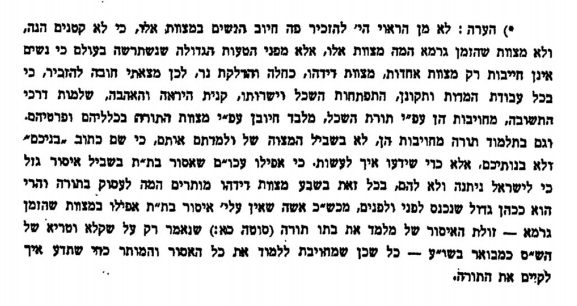 I happen to come across a piece from Rabbi Avraham Grodzinski (see here), a Mashgiach in Slabodka. He is in the middle of a piece elaborating on the place of the human intellect in religious life and its status as a source of obligation. In that context, he has footnote why he thinks that women are obviously, to an extent, obligated in Talmud Torah, even if they are not formally included in the obligations derived from pesukim. The whole chapter is worth reading, but I have copied the relevant footnote below. I hope the picture is clear. If not, a PDF can be accessed: here. The whole piece is available in the sefer Toras Avraham pages 256-277. Anyway to get a copy of the whole piece? Just to see it in context? It’s on Otzar HaChochma. I can send you the whole piece if you would like.